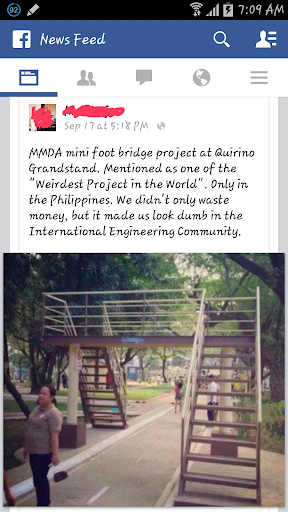 Posted above is a photo excerpts from Facebook bashing about this mini footbridge inside Quezon city meomrial circle. A lot of bashers of our friendly netizens that say "its a shame that our government allocated a budget" and that international engineers will make fun of it. Unfortunately,it's not for you adults to try these mini footbridge.It's for your little ones.Educating them of the right way crossing streets wherein a footbridge is available. To the one who posted this photo... haven't you check if your car would fit in to that road?